DISCLAIMER: While I know a thing or two, there's a reasonable chance I got some things wrong or at very least there are certainly more efficient ways to go about things. Feedback always appreciated! 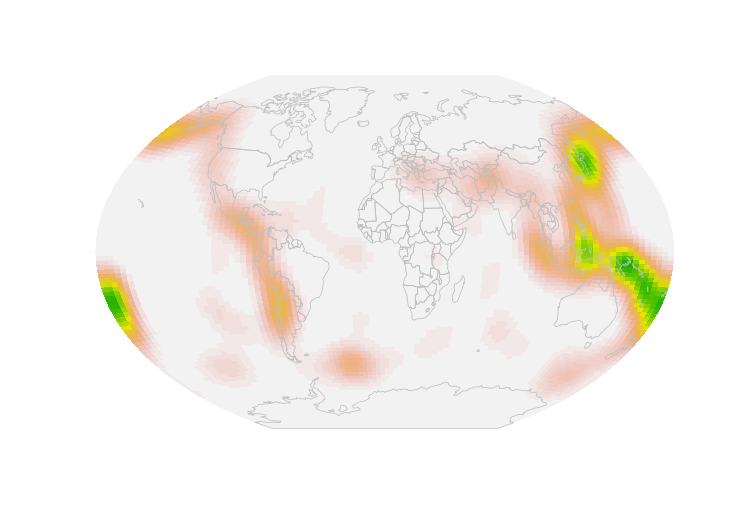 Last time we made contour maps of densities of points on a globe, now it is time to take another step and make heatmaps. 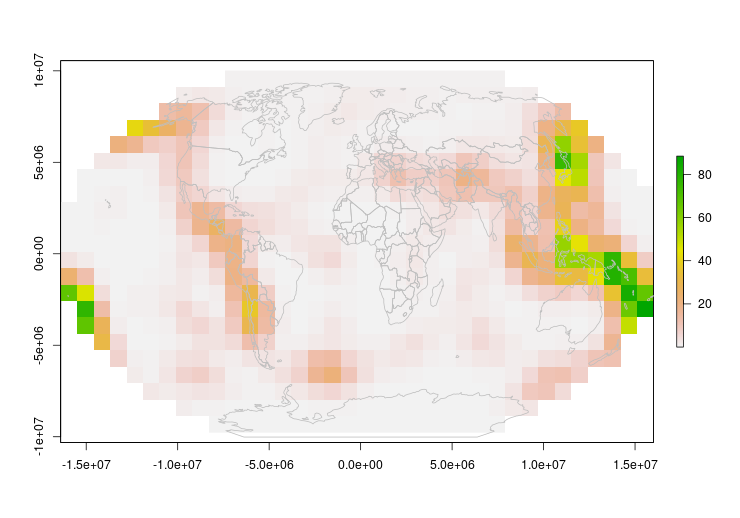 We created all the data we needed when creating the contours, but heatmaps add new challenges of dealing with large amounts of raster and polygon data. Lets get to it. We'll also use the same vmf_density_grid function we introduced in the Intro post. Global Earthquakes from Northern California Earthquake Data Center is a great dataset we'll continue to use, so we start with a set of quakes since Jan 1, 1950 of magnitude 5.9 or higher. Once we have the densities, we need to coerce them into a spatial format – in this case we'll create a SpatialGridDataFrame, matching the grid of densities we calculated with vmf_density_grid. Great, we have a heatmap! But it is in rectangular coordinates, we want to project it to something nicer, like a Winkel triple. There's a problem though… We can't just re-project our SpatialGridDataFrame – it gets interpolated into points, losing our nice pretty smooth heatmap. This is really slow, so we have to turn the resolution way down. I guess this works, but the low resolution suggests we can do better. Making features valid – Both for the world and our heatmap polygons I jump through hoops to make sure only valid polygons get through to the final plot. substr(pol.colors, 8, 9) <- "00"
Looks pretty good, but we do have some interesting world map problems with countries popping out as they reach the edge… Something to investigate another day. In both these examples we've used global data as it shows the problems of using “traditional” density estimators, but the same issue exists at all scales. It is just a question of when a simpler approximation is reasonable. You can also see a bit of blockiness which we could reduce with an increase in grid size, but that will be very dependent on need. This calculates a grid of densities which can then be used with geom_contour. The code basically comes directly from Directional's vmf.kerncontour, only returning a data.frame instead of actually plotting the output. Earthquake data was accessed through the Northern California Earthquake Data Center (NCEDC), doi:10.7932/NCEDC. It always happens… I get interested in what I think will be a small data project to scratch some itch and end up down a deep rabbit hole. In this case, a passing interest in the geographic distribution of some samples (more on that in a future post) led to a deep dive into spherical distributions and densities. While I got interested in figuring out densities for the purpose of figuring out the density of points on a map, there are plenty of other cases where you might be interested in the distribution of points on a sphere. The trouble is that most functions commonly available, e.g. 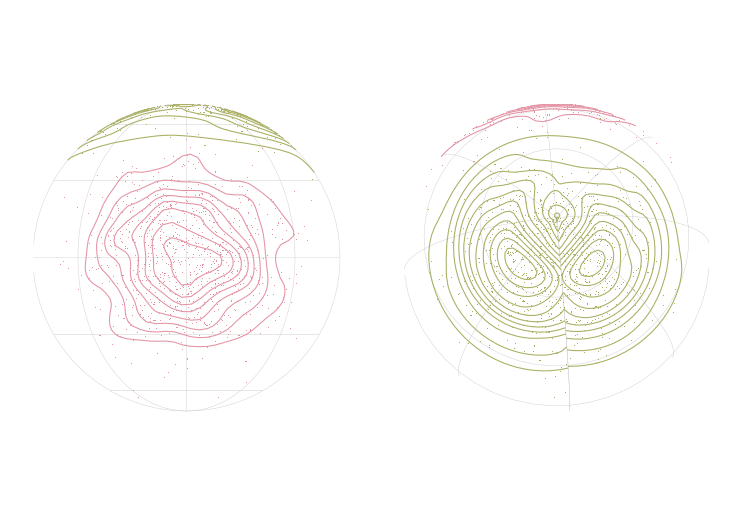 geom_density_2d from ggplot2, only handles regular grid coordinates. 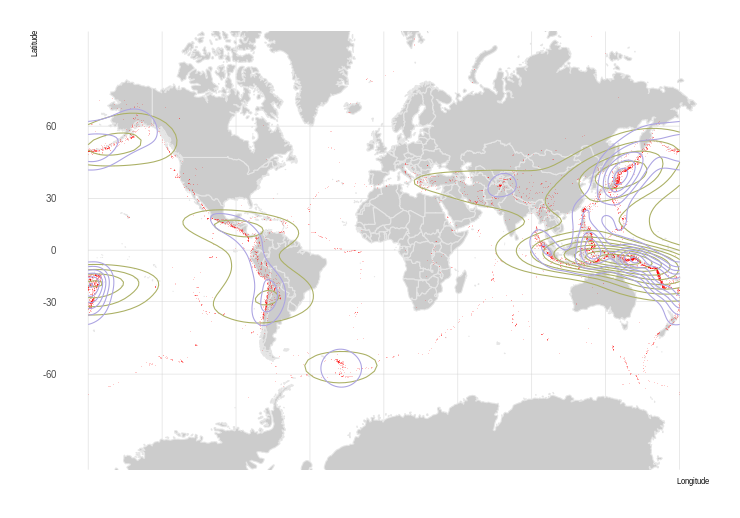 Global densities simply fail at the 'edge' of coordinates – e.g. near the poles or near +/- 180 degrees longitude. Projection issues. On small scales and near the equator, it is generally safe to make the simplification that longitude/latitude forms a square grid. As you look to larger scales and close to the poles, that assumption breaks down. 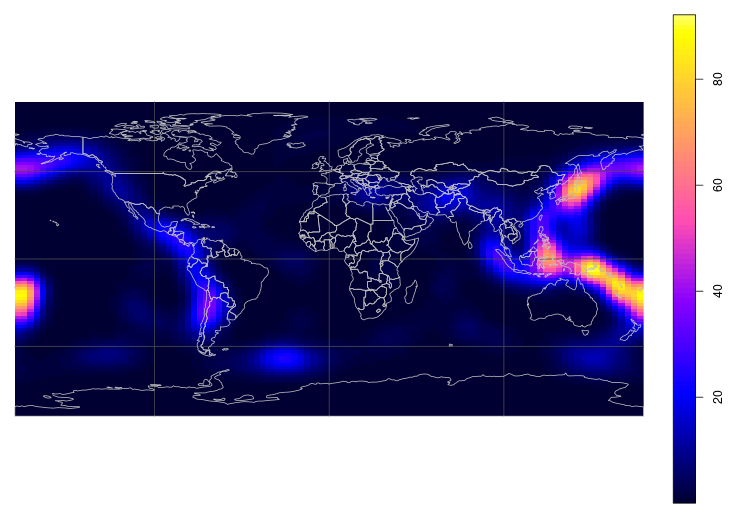 I think it is important to point out that there are many tutorials on plotting event densities on maps (e.g. crime occurrences), but that these are all at the city level, where the problems of using existing methods is a reasonable approximation. Next, for this example, we'll be using a random blob placed on a sphere. I'll use the rvmf function from the Directional package. Directional is a general purpose library using Latitude defined from 0 to 180 degrees and Longitude from 0 to 360 instead of -90 to 90 and -180 to 180 respectively. The random_points function here gives us points in a coordinate system we're used to. To visualize the problem, we'll create 2 sets of points, one centered on the map, the other near the pole and near 180 degrees. 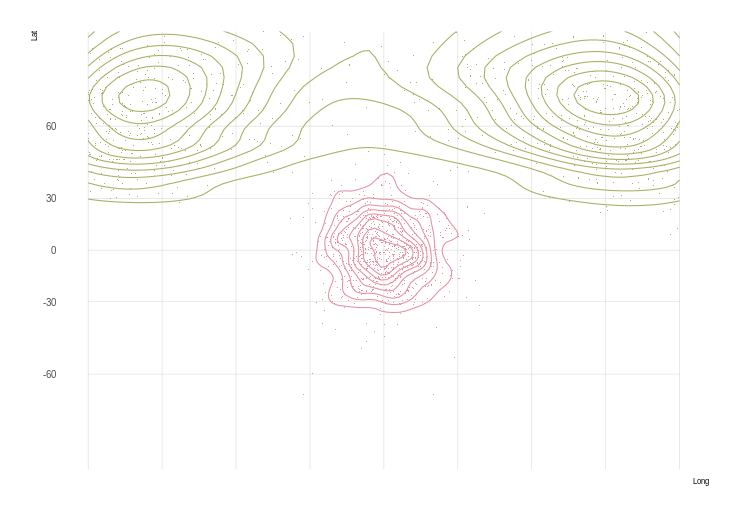 We'll then plot the contours of the densities to show the issue. We can quickly see the problem looking at the blue offset density plot – there are multiple “centers” and the contours don't connect cleanly. The solution is to use spherical densities an fortunately, the Directional package provides functions for spherical (and in fact, circular and spheres of arbitrary dimensions) distributions using the von Mises-Fisher distribution. Before we fix the problem using spherical densities, we first need to do some setup. We'll be using vmf.kerncontour from the Directional library, but in current CRAN version (3.2), that function plots contours itself. We want to get the data to perform the plots ourselves, so we need a version that returns the data. The next version of the package will have that option, but in the meantime we put the code for the revised function in the Appendix as vmf.kerncontour.new. Similar to what we did for random_points, we also need to perform some translation of vmf.kerncontour's input and output to out more familiar formats. Now we can go ahead and calculate the densities and plot the contours. We'll keep the “bad” contours for comparison. 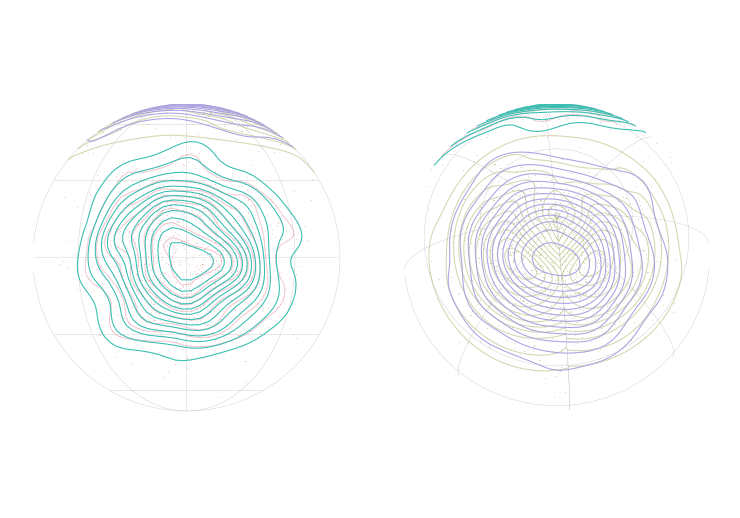 Particularly looking at the orthographic plots, it is easy to see that the spherical density process gives the same rings in both locations, with continuous curves. Earthquake density is used in one of the few existing attempts to perform density calculations with spherical coordiates on R-Bloggers. The Northern California Earthquake Data Center provides an archive of earthquakes for download, so we start with a set of quakes since Jan 1, 1950 of magnitude 5.9 or higher. 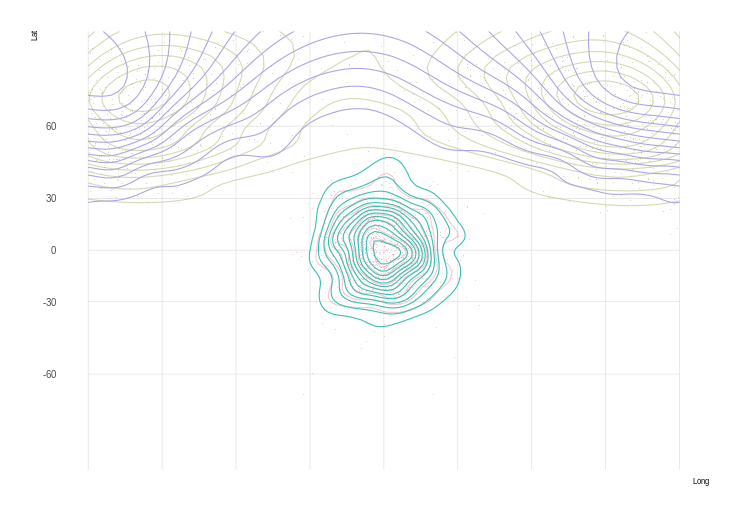 Given that data, we then follow the same process as we did with our random data to plot both the 2d density contours and the density contours using spherical functions. The yellow shows default 2d density, and you can again see the continuity problems. The blue shows the expected Ring of Fire thanks to the spherical density. It isn't perfect – if we were really interested in the most accurate results, we'd probably want to turn up the grid size to better follow the chains of quakes or tweak the contour breakpoints to see the fine features. This should be a good first step to looking at densities in geo events. More Real Examples – I mentioned I had an actual project I was curious about, right? 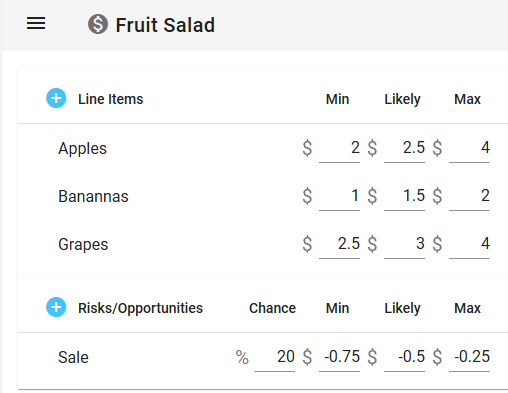 While finding current prices would reduce much of the uncertainty, while fruit (at least where we’re based) is priced by weight, it is sold by unit. Since no piece of fruit is exaclty the same weight, if we need 2 apples we can’t say precisely how much that will weigh, so we still have some uncertainty. 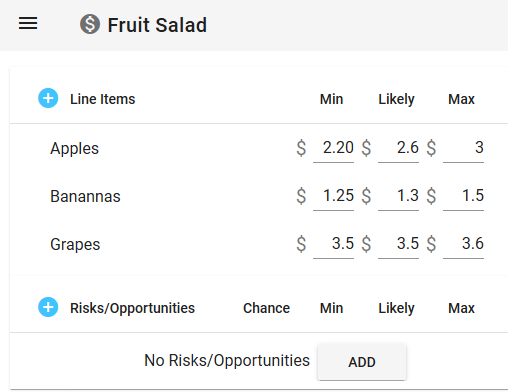 The exact price of the produce is called a reducible source of uncertainty. We were able to eliminate that source of uncertianty by putting in the effort to eliminate it completely. We’re so exited to see the response to our launch, we wanted to let you know what you can expect from us in the coming months. To fulfill out mission of bringing advanced tools to leaders at all levels, we launched with just the basics in place and have so much more planned. To keep things simple, we currently do now allow sharing simulations. Our first major feature is to allow sharing simulations for collaboration and in a read-only mode. This will also allow you to share simulations publicly so anyone with the link can view it. We know that not everyone runs their projects in the same way and while we’ve always planned on supporting agile methodologies, finding the right general approach has delayed our first implementation. In the coming months we’ll be releasing a third simulation type to support people using scrum/agile methods for projects. While we don’t expect anyone to immediately turn around and project our presentations, we do want to provide slides people can use to share plans and progress in easily editable formats. A major assumption of our overall approach is that individual tasks or line items are independent of one another. In practice however, actual outcomes tend to all run low or high. This feature will be as easy to use as the rest of DartCannon and will truly provide insights unavailable from other easily accessible tools. While many projects have the benefit of only needing to worry about budget or schedule independently, if you don’t have that luxury you’ll need to see how they both come together. We’re still working on prioritizing all these features and would love to hear from you in what would be most beneficial to your work. We’ll always continue with new tutorials and guides to getting the most out of DartCannon along with bug fixes and minor quality of life improvements.